Workers will bring in 20,000 cu. yds. (15,291 cu m) of dirt to repair the embankment slide. Work began this January on a $6.5 million U.S. Army Corps of Engineers project to repair flood damage at Lewisville Lake Dam near Dallas. Rising water levels during last year's floods caused a 161-ft. (49 m)-long embankment slide of the 6.2-mi. (10 km) lake. Repairs to the earthen-rolled dam had been scheduled for right after Thanksgiving, but heavy rain in the area delayed the process. An earthen-rolled dam is a type of embankment dam made of compacted earth. Although the landslide was considered significant, Army Corps of Engineers and Dallas-area lawmakers in December ensured Dallas residents that flood waters would not flow from the dam into the city. Following the initial flooding, strong winds shredded the tarp covering the damage at Lewisville Lake Dam. Slide repair contractor Bristol General Contractors LLC, based in Anchorage with an office in Dallas, is on site and is constructing haul roads on government property next to the dam. Notice to proceed on the project was granted on Nov. 29 and repair work is scheduled for completion in late spring or early summer. Mike Kingston of the U.S. Army Corps of Engineers is project manager. The project does not include subcontractors. Kingston reported that the reconstructed embankment will be protected by stone riprap on the upstream side and Bermuda grass sod on the downstream side. 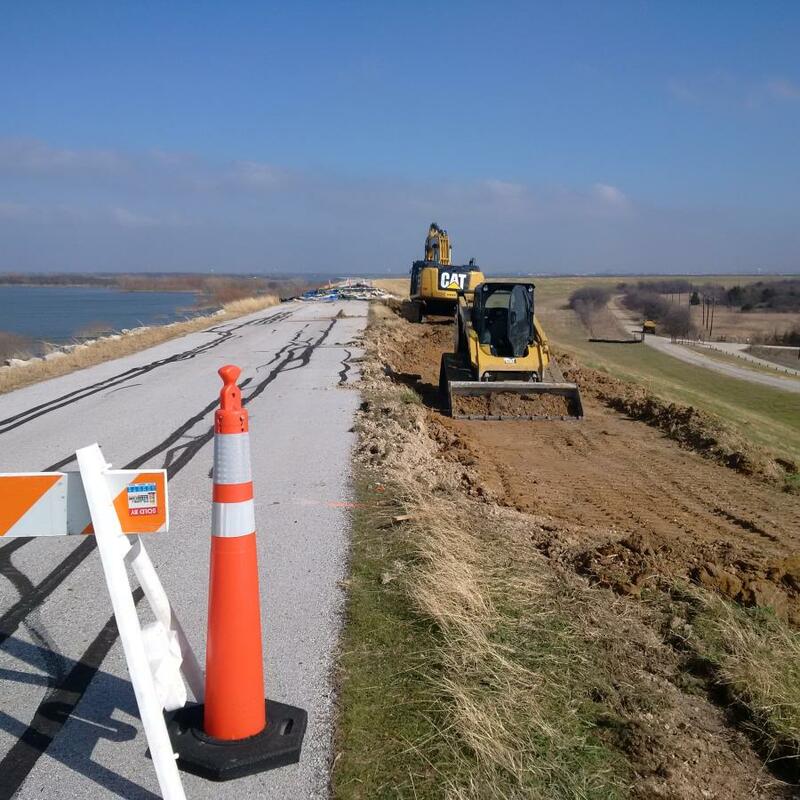 The project also requires removal and replacement of a portion of the asphalt roadway and sub-grade layers along the embankment crest. As of early February, workers were building a pad for an excavator and constructing roads for haul trucks on the embankment. Workers will bring in 20,000 cu. yds. (15,291 cu m) of dirt to repair the embankment slide. Riprap will be used to protect the embankment. Other materials being used for the project include bedding, geomembrane, filter fabric, turf and road construction material for the crest road. Geomembranes are relatively thin sheets of flexible polymeric materials that are by nature impermeable, thus providing a barrier to movement of water and fluids. Filter fabric is a tough fabric that screens out soil while allowing the passage of water. Currently, about 13 workers are at the job site each day, Church said. They are using a small excavator, a roller-compactor, haul trucks and an articulated dump truck, also referred to as a dump hauler. The undersized bridge that provides access to the site for heavy equipment will need to be reinforced, Church said. Also high water levels and rain delayed start of the project by several months. Church reported that the project is not affecting any camping or residents in the surround area. “Only roads inaccessible to the public have been impacted,” he said. The slide was quickly discovered by Lewisville Lake personnel during flooding that occurred in late June. The personnel were monitoring the dam around the clock because of high water levels. Officials described the type of slide that occurred as typical on earthen-rolled dams. But the damage requires action to ensure continued integrity of the dam structure. The Army Corps of Engineers reported that despite the damage, the dam is not currently at risk of failure. Flood water from heavy rains in December is currently being released through the dam's outlets. “Life safety is our main priority within the Army Corps of Engineers,” said Col. Calvin Hudson II, commander, Forth Worth District, in a release. He added that dams are designed and built to reduce flood risk, but they cannot eliminate all risk.